The DCS WiFi Companion 2nd Edition is Now Available!! I am pleased to announce that, effective immediately, The DCS WiFi Companion 2nd Edition is available! This newly updated and expanded, 242-page, four-color guide discusses, in detail, how to implement complete WiFi control of DCS on new and existing layouts. It contains more than 100 pictures and illustrations that educate the reader on the basic and advanced, features and functions of DCS from the point of view of the Premium version of the DCS App for smart phones and tablets. Capabilities and use of the Premium version of the DCS App. Implementation of DCS WiFi on new or existing layouts via standalone or home network access. Setup, installation, operation, and software updating of the Wireless Interface Unit (WIU). Expanded coverage of troubleshooting and DCS App operation. Installation and operation of MTH's new DCS Explorer. Adding Lionel® Legacy and TMCC, LCS components to seamlessly operate those command control locomotives. Installation of the DCS Application on a Kindle device. How to simulate Z4K Tracks. Controlling the Lionel® TMCC Crane Car with the DCS Application. Adding duplicate engines to the DCS Application. Differences between Android and iOS versions of DCS Application screens. Moving lashups, and TMCC and Legacy engines between the Inactive and Active Engine Lists. New information regarding Import and Export. Additional troubleshooting WiFi connectivity and PS2 engine battery issues. How to update the WIU’s firmware using an iOS or Android, smartphone or tablet. You can purchase the new printed book from many fine OGR sponsors, and also directly from MTH as either an eBook or a printed book. I hope that you enjoy reading The DCS WiFi Companion 2nd Edition as much as I enjoyed writing it! 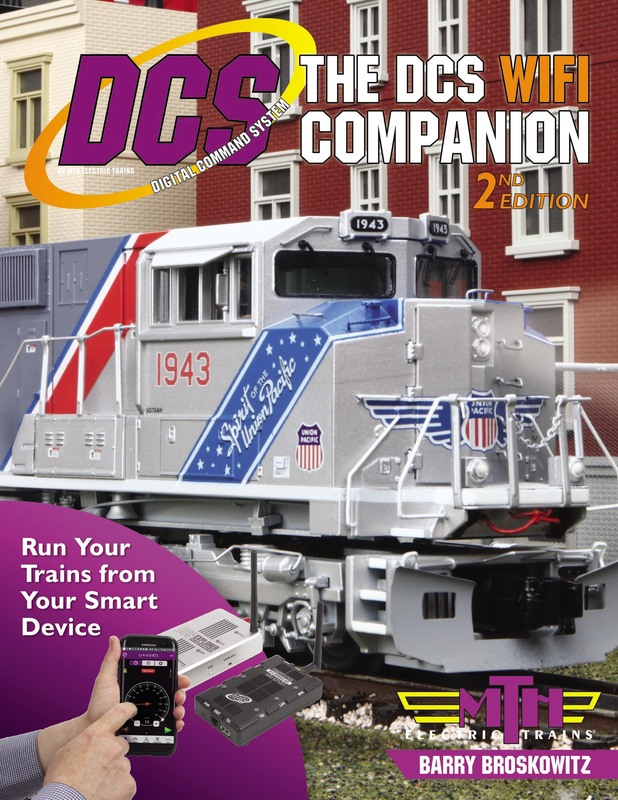 Everything that you need to know about DCS WiFi is all in MTH’s “The DCS WiFi Companion 2nd Edition!" This book is available from many fine OGR advertisers and forum sponsors, or as an eBook or a printed book at MTH's web store! Train-Ca-Teers - All For O and O For All! Thank you Barry for working so hard to complete this edition! I am looking forward to getting a copy and using it! Barry, for an Android 10.1 inch screen tablet running Marshmallow 6.0.1, what is the best/preferred e-reader app to use for the digital ebook version so it will look exactly like the print version? I use adobe reader and Freda on my Samsung tablet. Any tablet with the Adobe Reader application should display the eBook exactly like the printed book. Is it free for those who already bought the first edition? I doubt it's free, Bill, since it's a new edition. The 2nd edition is a major revision of the first edition. It is not a free update. So are these items which are going to be covered in seminars at York covered in the book? Updating the firmware in the WIU and the DCS Explorer. What is your cell number? Yes, all of it's the 2nd edition, in detail. In fact, it's also in the 1st edition, though it's better in the 2nd. I don't post phone numbers on public forums. E-mail me your phone number and I'll call you. I ordered the three copies of your book as soon as it was available on Amazon. One for a friend, and the rest for myself. I also purchased the electronic copy as well. So, I hope that these purchases will add to your retirement fund. I will see you at THE DCS Seminar so I can get your priceless signature. Until then, Thank You again and those who helped you write this latest edition. I will see you at THE DCS Seminar so I can get your priceless signature. I don't know about "priceless", however, I'll be happy to sign your copies! Congrats, Barry, on what I am sure is a comprehensive and very informative new edition. I look forward to purchasing a copy at York in a few weeks. FYI, although several dealers have purchased copies for resale, I don't know if those dealers will be attending York. If you want a to purchase a copy (and I agree that you definitely should do so ) at the York MTH is accepting orders for York delivery. You'll have to call them to place an order. I ordered the book and received it yesterday, well written and easy to read. Thank you it has been a great help in the planning of the wiring of the layout, again many thanks. Than ks for purchasing my book - I hope you enjoy reading and using it! I just purchased the 2nd Edition WIFI Companion at a local train store on their recommendation to help planning a new layout. I don't have any DCS equipment at this time and I'm not sure I want to run WIFI and may use the DCS remote. Did I purchase the wrong book for an absolute beginner who may be using the DCS remote or would the standard 3rd edition be better. My iPad is an older iPad 2. Will the DCS wifi app run on older hardware including my iPad 2? If you plan to run DCS using the DCS Remote, the book you want is The DCS Companion 3rd Edition. The DCS WiFi Companion 2nd Edition does not address using the DCS Remote at all. It is only concerned with running DCS using the DCS App. There are two books because DCS is operated very differently, depending upon which device you use. The DCS App should run fine on your iPad 2. Just make sure that the iPad 2 is running the latest release of iOS of which it’s capable. Barry, I cannot locate the first edition of the MTH DCS WiFi Companion eBook since my my laptop had a small problem. Can you tell me how to get a copy of the Original MTH DCS WiFi Companion 1st Edition. Thank You for your time. Just login to Shopatron/Kibo here and download another copy. Barry, thank you for your help but, in my stupidity, I forgot the password. With Shopatron/Kibo's help, I now have the password back and all is well. Again, Thank You for your help. Barry: I just received your book DCS WIFI Companion 2nd Edition. I was reading on how to upgrade my TIU and the book you stated Widows PC is required. I use a Mac and I Pad. Will I be able to upgrade my TIU on the Mac or must I use a Windows PC.? I do have one but a turtle is faster. Also I have the 2nd Edition of you DCS Compainion and in your WiFi book foreword you mention the 3rd Edition. Is the 3rd Edition a must to get the most of the WiFi book? I am just getting into the WiFi mode to operate as everything has been packed up for over a year and want to upgrade the software in my TIU now while the layout is under construction. Also can I run PS1 & PS2 locomotives with the WiFi system? How do I determine the current software level in my TIU? Thank you very much. Ride their father's magic carpet made of steel"
"This train got the disappearing railroad blues"
I use a Mac and I Pad. Will I be able to upgrade my TIU on the Mac or must I use a Windows PC.? The Loader Program can be run on a Mac that has a Windows environment installed. The DCS WiFi Companion 2nd Edition discusses how to do this on pages 155-157. Also I have the 2nd Edition of you DCS Compainion and in your WiFi book foreword you mention the 3rd Edition. Is the 3rd Edition a must to get the most of the WiFi book? The DCS Companion 3rd Edition only has a single chapter that discusses the Standard version of the DCS App. That information is a small part of what is in The DCS Wifi Companion 2nd Edition. This and a whole lot more about DCS WiFi is all in MTH’s “The DCS WiFi Companion 2nd Edition!" Sorry to cut in but you forgot to answer his last question about PS1 and PS2 running on WiFi. I will let you (the Master ) answer as I do NOT want to step on toes or answer incorrectly. His last question was how to tell version of current TIU. Also can I run PS1 & PS2 locomotives with the WiFi system? You run the PS2 engine using the Premium DCS App's Engine Control Screen and the PS1 engine using the Track Control Screen. How do I determine the current software level in my TIU? From the DCS App's More... Screen, navigate to Advanced Features, System Settings, TIU Settings, select your TIU and tap on TIU firmware near the top of the screen. Barry: Thank You with all my stuff still to be found and unpacked this whole WiFi thing has been a bit difficult and still learning. I thought I was pretty comfortable with DCS but a whole new word with WiFi and looking forward to getting it up and running. So again Thank You for answers and guidance. Rick, I am still a beginner on WiFi but I got trains running pretty easily. I wish you well!! Mark, Thank You I am looking forward to getting them running I am thinking about just laying a circle of track on what I have already built just to run trains. I have not gone this long without being able to run any trains in almost 27 years. That was how long we were in our old house and I had a layout. Ants in my pants so to speak. Rick, I know what you mean. It is hard to wait to get things going. Do I need to buy the Lionel wi fi to get full functions out of legacy engines running with DCS wi fi on top of all the gadgets I already bought? At present, the Premium version of the DCS App can operate nearly every feature and function of Legacy engines. Lionel 6-81499 LCS DB-9 Cable With Power Supply. Refer to The DCS WiFi Companion 2nd Edition, Appendix F: TMCC and Legacy, on 220-231, for all of the details. Barry thank You so much for your reply,You just saved me some good bucks,now I can buy Your book!!!! Lionel 6-81326 SER2 LCS Module. I describe the SER2 as a WiFi device rather than an LCS device so as to ensure that one does not think that the LCS module is required in this case, which it is not. I'm not sure I understand. The LCS module that is needed is the SER2. There is nothing WiFi about the SER2. It's confusing to me but if you understand it I guess that's all that counts.